We should start by saying that "Eyes Turned Skywards" has been written by a member of the team here at Undiscovered Scotland, and this could conceivably mean that we are just the tiniest bit less objective about its merits than we usually are when reviewing books. Having said that, even if we'd not seen the book develop over a period of several years, we suspect we'd still think it was an excellent read. 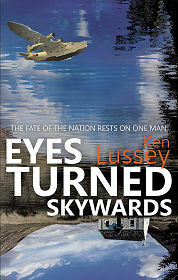 "Eyes Turned Skywards" by Ken Lussey is a thriller set in Scotland during the Second World War. It follows the efforts of Wing Commander Robert Sutherland to uncover the cause of the air crash in northern Scotland that killed the Duke of Kent, brother of King George VI, on 25 August 1942, and of a second crash that might have been linked to it. It is set against a background of a country that is far from united behind Winston Churchill, and the ever-present threat from the enemy. All the action, barring the prologue and epilogue, takes place during a single week in September 1942. Bob Sutherland had been a detective in Glasgow before the war, but his real love was flying and he went on to become one of the RAF's top aces during the Battle of Britain. Just as that battle was won, Bob was shot down: an event that, for a while at least, ended his flying career. We meet him in 1942, commanding a unit responsible for training pilots. But when almost no-one else can be trusted, the powers-that-be feel that Bob has the right credentials to find out what lies behind the deaths of the Duke of Kent and the other men who died with him. Bob visits the aircraft's base in Oban and the crash site in Caithness, and teams up with M15 agent Monique Dubois, a woman with a dark and exceedingly complex past, as events spiral out of control and discovering the truth becomes ever more difficult. "Eyes Turned Skywards" is a work of fiction, but at its heart is a real-world mystery. The Duke of Kent was actually killed in an air crash on a Caithness hillside in 1942, in a place where his aircraft should never have been. Over the years there have been many theories about what caused the crash that killed him. Was it a simple - though remarkably large - navigational error, or was his aircraft sabotaged? He was supposed to be flying to Iceland to bolster morale among British forces there, but it's been suggested he was actually engaged in a much more important, and sensitive, mission. This book takes that mystery as its starting point, and builds a web of intrigue around it which draws the reader in to a world that is surprisingly far removed from the northern Scotland you can visit today. An author's note at the end of the book disentangles fact from fiction. Perhaps the most surprising thing is the extent to which the book is built on real events, though this does help explain the grip it exerts on the reader.